Stuffed white Zucchini in Tomato Sauce was the ultimate comfort food for me growing up, and today it’s one of my children’s favorites. Humble yet delicious and nutritious, it can be stuffed with meat and rice or even made vegetarian style. 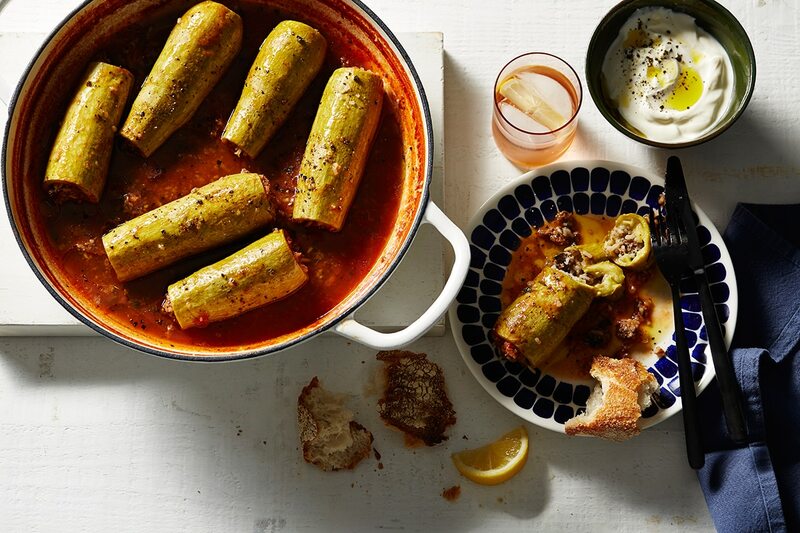 This dish is essential in any Levant home kitchen and is often made also made with stuffed eggplant as well. In Canada, white zucchini is usually found in Middle Eastern supermarkets and are usually quite large inside. So try choose small white zucchini, that are equal in size. Soak rice in hot water for 20minutes and then strain. While the rice is soaking, remove stems from the zucchini and core them inserting a corer until almost reaching the bottom, then twisting and pulling out the core. Repeat a few times, scrapping until hallow. Prepare rice and meat stuffing by combining olive oil, cinnamon, all-spice, salt and tomato paste in a large bowl. Add lamb and mix with your hands well. Stuff the vegetables until they are a little more than three quarters full, leaving a 1cm room at the top. Do not push the stuffing in or over stuff the zucchini as this will prevent the rice from cooking, rather tap the bottom of the zucchini on a surface to help drop the stuffing through. In a large pot, fry garlic with some butter and turn off heat and stir in tomato paste. Arrange the stuffed zucchinis at the bottom of the same pot and pour over the tomato puree, chicken stock, all-spice and salt. Bring to a boil over high heat for 10 minutes. Reduce heat to low and simmer for about 1 hour or until done. Half way through taste the sauce to adjust the seasoning. Remove from the heat and strain the tomato broth into a serving bowl. Arrange zucchini on a serving platter and serve with sauce on the side or pour sauce all over zucchinis.